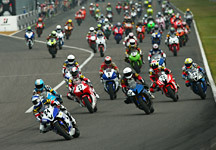 Great Success for Indonesian Teams 1-2 Class Finish in Their First Suzuka 4 Hours! 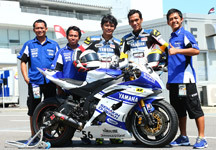 - News Releases | Yamaha Motor Co., Ltd.
Great Success for Indonesian Teams 1-2 Class Finish in Their First Suzuka 4 Hours! 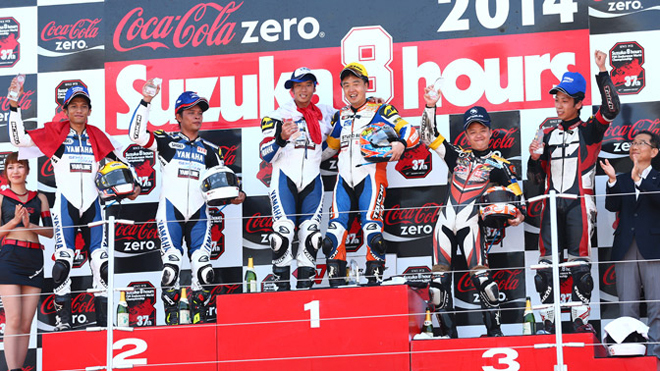 IWATA, July 28, 2014 – Yamaha Motor Co., Ltd. (Tokyo: 7272) announces results of the ST600 Class of the Suzuka 4 Hours Endurance Road Race/Round 4 of the 2014 Suzuka-Kinki Road Race Championship and Suzuka Sunday Road Race series that was held on July 26, 2014. Yamaha Motor group company PT. 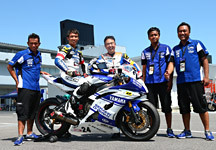 Yamaha Indonesia Motor Manufacturing (YIMM) entered two teams riding the YZF-R6 in this race: the "Yamaha Racing Indonesia A" team on the #24 bike and "Yamaha Racing Indonesia B" team on the #56 bike. 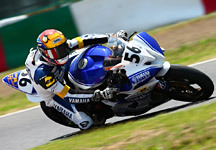 Running at a consistently fast pace throughout the four hour race, the #24 team brought Yamaha its first win in the ST600 class of the Suzuka 4 Hours, and was followed by the #56 team in 2nd place to give the Indonesian teams a 1-2 class finish. The race began at 9:00 in the morning with a Le Mans style start, and pole-sitter Sudarmono on the #56 bike, who had set new course record while qualifying on the 25th, got off to a slow start and gave up the lead to #24 rider Imanuel Putra Pratna, who got the hole shot from 4th position on the grid. However, the order would continue to change in the first lap and Imanuel would drop to 2nd place and Sudarmono to 6th. Meanwhile, Ahmad Afif Bin Amran, the first rider of the #50 "PETRONAS Hong Leong Yamaha Malaysia" team entered by the Malaysian Yamaha Motor group company Hong Leong Yamaha Motor Sdn. Bhd. (HLYM), took a fall on the second turn of the second lap and the team was forced to withdraw from the race. 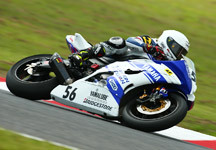 Riding on machine #24, Imanuel and his teammate Shigeru Ibaraki completed the entire race at a steady and fast pace. In the early stages of the race, while running on pace for a podium finish along with #56, #24 was finally able to take the lead on lap 49, the approximate halfway point of the race, but on lap 59 the team was overtaken by another YZF-R6 team, #75. After that, #75 stayed in the lead until around lap 90, when Pratna on machine #24 engaged it in a closely fought battle for the lead. But, by the 93rd lap, #75 was able to pull away and looked to be on its way to a runaway victory, until it had a collision with a backmarker and fell with just five minutes remaining in the race. This put Pratna in the lead again and he was able to hold it to the end to win the race. As for Sudarmono on machine #56, after his slow start he quickly recovered and showed his speed by returning to the front and taking the lead on the eighth lap. After that, he was passed by machine #27 and dropped to 2nd place, which he held until the first pit stop. But, a fall on the pit road and then a speed violation dropped the team back to 19th position. From there, however, both Sudarmono and his teammate Sigit Purno Harjono never gave up and continued to push hard toward the front until they had recovered to 10th place by mid-race and to 3rd place by the 77th lap to chase the two leaders. Then #75's crash moved them up to 2nd place behind #24 at the checkers. This result gave the Yamaha Racing Indonesia A and B teams a 1-2 finish, while 3rd place went to another YZF-R6 team on the #124 bike, giving Yamaha a full sweep of the podium. Also, in the ST600R (Revival) class race that was full of upsets, Yamaha teams scored another clean sweep of the winners' podium. "This was super exciting! I want to give my heartfelt thanks to the team and all of the sponsors that supported us. In the opening stages of the race, I was pushing too hard and realized that I couldn't last the whole four hours like that, so I decided to pace myself. During the last few laps, I was getting dizzy because of dehydration, but I had a big responsibility so I tried to do my best. My original teammate for this race got injured and couldn't compete, but we were able to win thanks to his replacement, Ibaraki-san, who came in on such short notice. I deeply appreciate what he did for us." "It was just ten days before the race that I was asked to step in as a substitute and I wasn't really ready. But the team did such a solid job and there was good cooperation from the sponsors, and I also got a friend to help me with the physical care so that an ordinary 45-year old office worker like me could make a podium finish. It's all due to the great efforts of my teammate. I'm really grateful." "I'm so happy! Thanks to the team and the sponsors, we were able to get a good result. On the pit road, I thought I'd put the speed limiter switch on, but when I opened up the throttle it started to accelerate, so I had to put the brakes on suddenly, and that's why I fell. I thought it was all over after that, but my teammate Harjono worked hard and we were able to get a podium finish. I'm really grateful." "After Sudarmono fell, I never thought that we'd be able to get a podium finish. Since we also had a pit stop penalty, to tell the truth, I was quite dispirited at that point. But, I was gradually able to get my motivation back and pick up the pace little by little. I'm very happy that we were able to work together to get this podium finish and I want to say ‘arigato' to Yamaha and the sponsors for their cooperation." "In the race, it was my mistake that caused the fall. It might have been because the tires weren't warmed up enough. I suffered a concussion in the fall and I don't remember what happened right after. I'm really sorry for my mistake though. It's unfortunate that I wasn't able to spend more time on the bike before the race this time, but it was a good experience for me to be able to ride with so many top-level riders, and I think it has made me mentally stronger. I hope I'll have another chance to participate in this race." "Since our goal was to finish the race, it's a shame that we had to drop out, but I'm glad that my teammate Afif was OK. Including the pre-race tests, I was really only able to ride the bike three times and since I'm used to competing on a 250cc machine, it was a good experience for me to ride the YZF-R6. It's such a different machine for me, so while there were some difficulties, I want to use what I've gained from this experience to become a rider who can compete on any kind of machine."